Humanity is frantically updating and building its infrastructures during Climate Change but not necessarily the right ones. 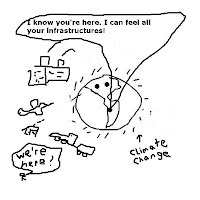 Infrastructure—gas and oil pipelines, telecommunication networks, water pipes, roads and bridges, waste treatment lines, buildings etc.—is a boring term that describes human built systems that supply 7 billion of us with vital life-sustaining elements. Cave men and women didn’t need gasoline pumps, electric outlets, Internet connections, toilets, a kitchen sink with hot and cold running water, but now humanity does. 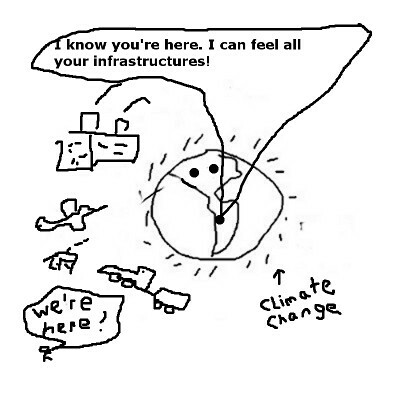 However, despite the message from climate scientists and the Paris Agreement, we are still putting too much of our time and money into the very infrastructures that got us in this climate mess. Our survival requires that we shift gears on infrastructure development immediately—if not yesterday. This week the Paris Agreement got ratified and will go into effect soon. While not perfect, as it is not legally binding and it doesn’t press hard enough for realistic carbon emission limits, the treaty does demonstrate that the world is waking up to the existential threat posed by our use of fossil fuels. That is to say, we have a real chance now that the Paris Agreement officially puts climate denial to rest. Our infrastructures, a great serpentine extension to our existence, are our environmental footprints. We are a great beast upon the planet. We share in our environmental impacts via our built conduits as we drink in humongous amounts of water from our lakes, streams, and aquifers, then excrete back contamination. We breathe in the life-giving by-product of our planet’s flora and exhale dangerous pollution that is killing millions. Our transportation systems trample and bifurcate innumerable ecosystems so we can get around. Thousands of miles of fossil fuel pipelines network through land and water, oftentimes bleeding their contents into their hosts and poisoning them. To sustain our existence, we need to quickly transform our infrastructures into benign systems that operate in harmony with life. Not in a warm fuzzy way but in a scientifically rigorous way. In part, the Paris Agreement is an attempt to shift our energy infrastructures to renewable energy, ones that don’t heat up the planet. In Rochester last Thursday, there was a press conference, part of a state-wide effort to get Governor Andrew Cuomo to sign the Geothermal Tax Credit Bill A9925/S6249. It was an excellent opportunity to hear about the importance of this renewable energy option from an exceptional group of speakers—our representatives, installers, environmental leaders, and geothermal business people--who articulated the importance of this pivotal moment in saving a crucial part of our renewable energy mix in New York State. But only one local media showed up so you might not have heard about this conference. Heating your home or business with geothermal energy can be expensive if there isn’t a tax credit to help offset the costs of installation. After an installation you’re good to go on a very inexpensive, non-polluting, non-greenhouse gas producing, and non-controversial renewable energy source for years and years. Those trying to save geothermal businesses in New York are trying to reach the public but that’s going to be very difficult if the press doesn’t show up. Our present media is an infrastructure also, an eclectic system of message magnifiers who are supposed to amplify what we need to know, not what the media wants us to know. The fossil fuel industry still gets billions of dollars in yearly subsidies to continue an energy option that is warming up the planet, while the geothermal renewable energy option, which can alleviate much of the greenhouse gases emissions (up to 35% in NYS) that come from warming buildings with fossil fuel, are dangling from a precipice, struggling to survive. Our infrastructures are now the way our life support system experiences our existence. This great beast, extending so many tentacles into our planet’s life-giving systems, must not be allowed to kill the host.